The 62nd edition of Eurovision Song Contest ends tonight! 26 songs will compete, and after 3,5 hours of music, performances, entertainment and excitement, we know the winner of Eurovision Song Contest 2017. The show starts at 21:00 CEST, live from Kyiv International Exhibition Centre in Kyiv, Ukraine. Hosts are Oleksandr Skichko, Volodymyr Ostapchuk and Timur Miroshnychenko. The running order is decided by the producer (Ukrainian broadcaster UA:PBC) based on a draw. "Welcome to the Eurovision Song Contest 2017"
After all the 26 songs are performed, it's time to "start voting", but it's the only time in the show that allows you to take a break or eat something, because the voting results will start being announced in just 30 minutes. However, the Eurovision show never has a break. 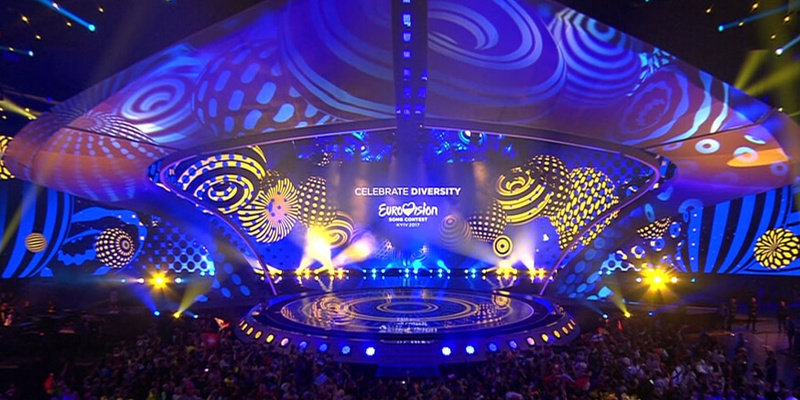 And this year, between the performances and the results announcement, we can see two of the past Eurovision winners, Ruslana and Jamala, the Ukrainian singers that took the contest to Ukraine following their victories, as well ONUKA, an electronic music band featuring Ukrainian folk music and motifs. The first one acting in this interval act is... Ruslana! Thirteen years after her victory, she's back to Eurovision, now presenting her new single "It's Magical", in an amazing performance, accompanied by twenty dancers. She's older, that's a fact, but no one can deny that she still rocks, and she will always have a spot in eurofans' hearts! Next is ONUKA... The band, the famous Ukrainian sound producer and musician Eugene Filatov (The Maneken) and Nata Zhyzhchenko (former vocalist of Tomato Jaws and Kooqla), was founded in 2013 and have released several albums and singles. They perform a medley of several songs, in a very good performance. Now, it's time to Jamala, following her performance in the interval act of the first semifinal. However, in this evening, she will perform her new single "I Believe in you", whose videoclip was shoot some weeks ago in Portugal. Yeah, we know, it's not something like "1944", but its love story is dedicated to her new husband. The winner of Junior Eurovision Song Contest 2016, Mariam Mamadashvili from Georgia, is also interviewed. The voting procedure will be the same as last year. Each country will have two sets of 1,2,3,4,5,6,7,8,10 and 12 points to give. One set for each country's jury, and one set for each country's televoting. Shortly after the Grand Final, the detailed results, voting and points will be revealed.